Optimal Leasing has partnered with Merchant Cash and Capital's (MCC) to provide some of its' specific customers with a menu of credit and industry-based programs that offer attractive options to almost any type and size of business. MCC simply "buys" a small percentage of future credit card sales and advances that money up front giving the needed access to quick capital to use in your business. 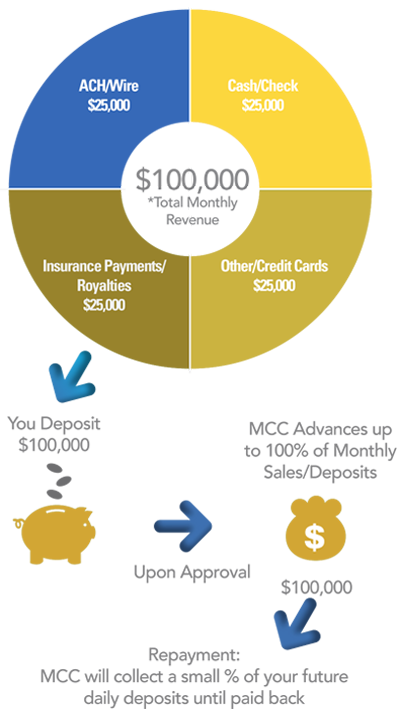 Benefits Of An MCC Merchant Cash Advance. Why Work With Optimal's MCC program? Since 2005, Merchant Cash and Capital has been dedicated to helping businesses grow and succeed by providing exceptional support, products, service and up to date techonology that has been approved by Optimal Leasing LLC as an aternaive funding for non-rated credits and small businesses. If you are a business owner that does not accept credit cards, you can still qualify for a cash advance. Optimal has partnered with Merchant Cash and Capital's B2B Advance program to make cash available to businesses that do not qualify for traditional cash advances. The B2B Cash Advance program is based on your Total Monthly Revenue, which is simply verified by your bank deposits. It's fast and it's easy. Inquire about the B2B Cash Advance program today and get the capital you need to grow our business. The Cash Advance program has been in place since 2005 and has been a valuable tool in helping businesses grow and succeed by providing support, products, service, technology. This B2B Cash Advance product has been in endorse by Optimal Leasing LLC to provide businesses with an affordable financing vehicle with flexible payback options to grow their businesses. With B2B Cash Advance, you will find that the underwriting department management team has the ability to work with a variety of industry types that most competitors are not simply equipped to engage.